Fanfares are strange things. Short, loud and flamboyant, like hearing an introduction being given by the world’s biggest extrovert. Back in the days when i flirted with being a percussionist, my role in fanfares seemed to amount to little more than providing brief, barely-controlled crashes and bangs at carefully-coordinated moments; and as a composer, the one time i’ve written one was when my then-fiancée asked me to compose the music to accompany her walking down the aisle at our wedding. Up to a point, convention took over: there weren’t any bangs or crashes (being for two trumpets and organ, only an accident could have caused them) but they remain 90 of the most overblown seconds i’ve ever created. Yet – maybe that’s exactly what a fanfare should be, maybe that’s the point of them. It’s conceivable that fanfares provide a kind of pre-concert equivalent of the post-concert applause: a huge burst of cacophony that cleanses the palate and clears the air in readiness for what is about to follow. 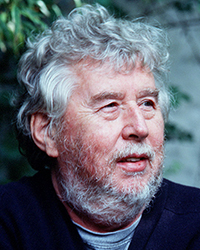 ‘Twas ever thus, perhaps, though ’twill not always be the case, and Harrison Birtwistle‘s latest addition to this particular genre certainly goes beyond standard issue bombast. A work for wind, brass and percussion composed to herald the start of the London Symphony Orchestra’s 2018/19 concert series, Donum Simoni MMXVIII is, at its title translates, a gift for the orchestra’s conductor, Simon Rattle. Though it lasts a mere 3½ minutes, the piece whips (or should that be rattles?) through a number of ideas. Birtwistle makes it clear at the very start that the heaviest of the heavy brass are of special importance. They get the piece going, with a chorus of the most boisterous growling – each player seemingly trying to outdo the others – that acts as an introduction, and the lowest of them all, a tuba, recurs prominently at several points. The first episode throws dry percussion counterpoint at a series of contorted chords from the wind and brass. That idea blows itself out, replaced by the tuba’s first spotlight moment, carving out a melody of sorts beneath the winds, who are now spritely hopping about. The next episode bluntly replaces this – Birtwistle doesn’t so much organise his material as roughly manhandle it – with a more robust rendition of what came earlier, big sustained notes and even more intense percussive clatter. Everything is broken-up here: flashes of melody, glimpses of gesture, yet retaining the sense that all the instruments are in sympathy with each other: it’s a party, not a punch-up. And then, with barely a minute to go, the piece turns on a dime, abruptly suspended, high winds floating eerily, and a brief second return of the tuba. Loud tubular bell clusters signal the end: everyone retorts with full-blooded, almost chorale-like chords, before the tuba returns a final time, a brief tongue-in-cheek solo cautiously descending into the depths. The world première of Donum Simoni MMXVIII took place on 16 September last year at the Barbican Hall in London, performed by the London Symphony Orchestra conducted by Simon Rattle. A nice piece and likely effective in the concert hall the way it starts with “LISTEN UP!” and tapers in the end with the whimsical tuba to whisper in the first work on the program.